Red Poppy: Pablo Neruda. Spreading poetry's potent power. Documentary Pablo Neruda: The Poet's Calling. The bilingual book of Neruda’s poetry from the legendary City Lights. The Essential Neruda for your Essential Support: Make a $25 donation to help us finish our Pablo documentary and received a signed copy as a gift. (Mark Eisner, the book’s editor and the movie’s co-director can sign it to you or someone else, with a personal inscription. Gracias to its legendary publisher City Lights for providing us the copies at cost.) No tax or shipping within the US (email us at neftali@redpoppy.net for international shipping). 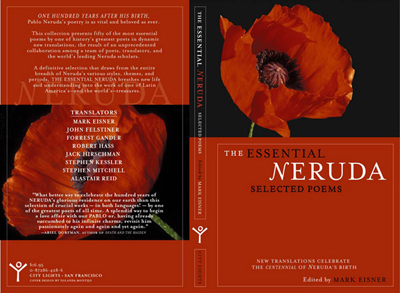 “What better way to celebrate the hundred years of Neruda's glorious residence on our earth than this selection of crucial works - in both languages! - by one of the greatest poets of all time. A splendid way to begin a love affair with our Pablo or, having already succumbed to his infinite charms, revisit him passionately again and again and yet again." Along with Mark Eisner, the books translators are: Neruda’s friend and favorite translator Alastair Reid; US Poet Laureate emeritus Robert Hass; Forest Gander, noted poet and head of Brown’s Creative Writing Program; Stephen Mitchell, the famous translator of the Tao Te Ching, Rilke, and many more; the acclaimed poet, editor, and translator Stephen Kessler; Stanford scholar of translation and poetry John Felstiner; and Jack Hirschman, recent Poet Laureate of San Francisco.